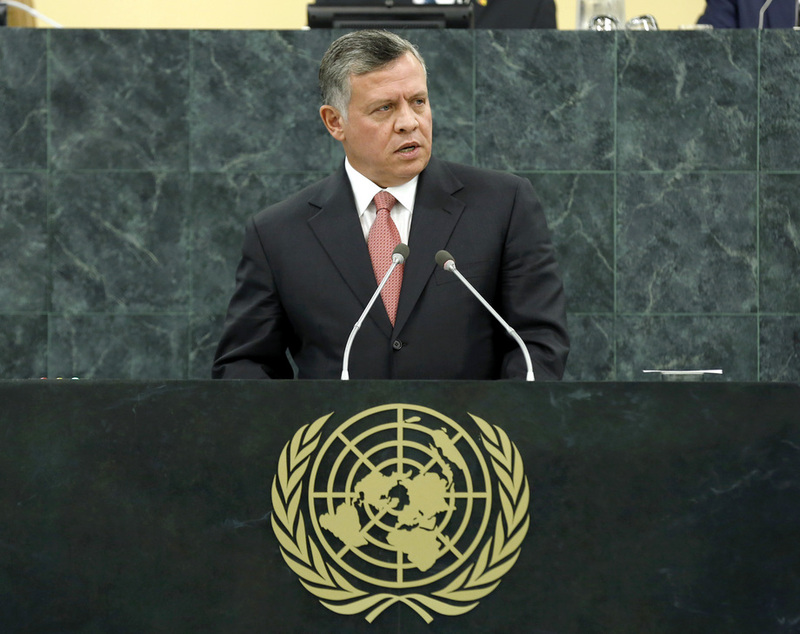 ABDULLAH II BIN AL HUSSEIN, King of Jordan, said global security would long be shaped by current events in the Middle East. “The region’s fires cannot be ignored,” he said, warning that escalating violence in Syria threatened to hollow out that country’s economic and political future, with extremists rushing to promote and exploit ethnic and religious divisions, upending the regional renaissance and risking global security. Last month, he said, Jordan had hosted 100 eminent Muslim scholars from around the world, noting that they agreed that there was no single prescription for an Islamic State. They affirmed that a modern Islamic State should be a civic State, founded on institutions, and with an inclusive Constitution based on rule of law, justice, freedom and equality of opinion and faith. He called on the Organization of Islamic Cooperation (OIC) to adopt the recommendations amid the current turbulence and transformations. Jordan had also convened an international meeting on the challenges faced by Arab Christian communities, and he stressed the essential role of Christians in the Arab world, urging all countries to stand with Jordan in support of diversity, tolerance and mutual respect. He said it was time to fast-track a political transition in Syria, to end the violence and bloodshed, neutralize the threat of chemical weapons, restore security and stability, and preserve the country’s unity and territorial integrity. The country’s future must be Syrian-led, but the world had a duty, an interest and the power to help them. That help should not be delayed. The number of Syrian refugees in Jordan equalled one tenth of the total population and could reach as high as 20 per cent within a year, he said, adding that their need for food, water, shelter, sanitation, electricity and health care was more than even the strongest global economies could absorb. Jordan was a small economy with the fourth highest water scarcity in the world, and while the response of the United Nations and regional and international donors had been generous, “the need is out-racing the response”. Turning to the Palestinian-Israeli conflict, which he called “the region’s core crisis”, he said he was encouraged by resumed talks. The resources that the conflict consumed could be better used, and with willing parties, determined United States leadership and strong regional and international backing, success was possible. He urged commitment from Palestinian and Israeli leaders to reach agreement within the set timeframe, and to avoid any actions that could derail the still-fragile process. There should be no settlement construction and no unilateral actions that could affect the status quo in East Jerusalem. A two-State solution could be reached, giving Israel real security, and normalizing relations with 57 Arab and Muslim countries. That would also give the Palestinian people the rights they deserved: a viable and independent Palestinian State, on Palestinian national soil, based on 1967 lines with East Jerusalem as its capital.